Fits all turbocharged Weber MPE-750 marine engines. 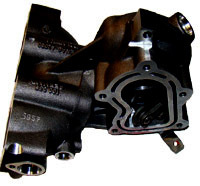 It includes the wastegate shaft, flapper assembly, all gaskets & hardware. This fits all closed loop engines, including Zodiac, Williams, Avon, Sugarsand and Polaris. The Hydrospace watercraft requires a different manifold assembly. Please check carefully as specific models may require a different exhaust manifold. You can find a direct link to your specific application in the Engine Parts section.